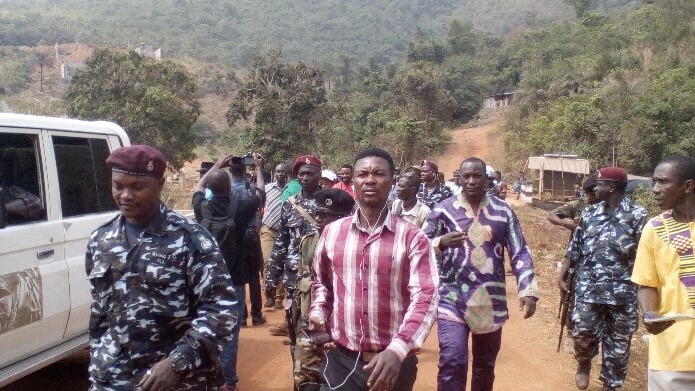 The minister was accompanied by a team of armed military and OSD officers when they carried out what many described as a controversial and malicious demolition exercise at Charlotte community where houses and pillars destroyed and tools including which they use to do their work at the site also stolen away by the gang on February 28th, 2019. According to the victims of the demolition at Hill-Top and Charlotte communities, they were shocked to spot the Minister, Dr. Sandy himself holding shovel, other destructive tools and pushing newly constructed fences at Hill Top and broken concrete blocks instead of allowing the acclaimed landowners as described by the Minister to remove their belongings after forcefully reclaiming the trumpeted states lands where people have sheltered their lives for years without dialoguing with them as accused state lands grabber. According to indigenes of Hill Top whose zincs were allegedly stolen with the aid of some staff of the ministry and Forest Rangers who are going to take over a private building which was converted by the Minister to a Government property. The alleged stolen zincs according to the tearing victims, were placed in one of the Minister’s vehicles to an unknown destination with the motive that the bundles of zinc would serve as exhibit against the evicted property owners but no matter tendered in Court for trial so that justice would have prevailed. Victims of the demolition therefore challenged whom they described as an aggressive Minister that, since the New Direction Government is emphasizing on zero tolerance to corruption, they have photo and video evidences to prove that some junior staff whose names would be published soon in subsequent edition connived with other set of people to take away the alleged bundles of zinc at Hill Top community, Hill Station in Freetown.